Sophisticated bottled water harvested from the Stellenbosch air has been launched in the Cape Town market. (Stellenbosch, September 2018) There are many bottled waters on the market; but water harvested from the air, is unique. Infinity Air Water is a new bottled water company whose source is the humidity in the air. This special condition makes the water perfectly pure, soft and alkaline (pH8). 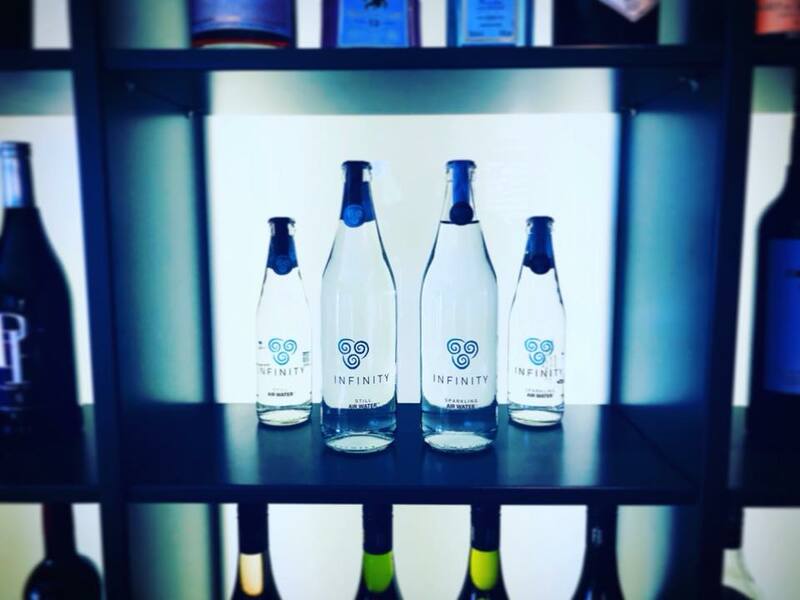 Infinity started its first harvest of the soft Stellenbosch moisture in July 2018 and now the company is distributing still and sparkling Infinity Air Water to hotels, restaurants, wine farms and corporates in Cape Town. The company was founded by Jacques Lubbe (South African) and Viviana Alarcon (Chilean) who met while working overseas and have just settled in the Cape. “The availability of clean drinking water is becoming more and more scarce, not only in our country but also worldwide. Yet we only need to consciously turn our gaze to the vast and infinite sky to witness the untapped potential of the humidity all around us. We choose to be part of the solution by using innovative technology to bring clean drinking water, effectively from thin air,” said Jacques Lubbe, Director of Infinity. In this way, Infinity is preserving ground and municipal water resources for the use of the City of Cape Town. “Due to the fact that we are harvesting one million litres of new water per year we are in effect adding the same amount to the city’s water balance over that period”, added Jacques Lubbe. Clean drinking water availability and plastic pollution are two topics of high concern in our local and global community. The company addresses both with its Sustainability Model. “Our clients from the hospitality industry can rely on our product”, said Lubbe. Infinity Air Water is harvested directly from the air and never makes contact with the ground keeping it free from elements that may alter its taste, resulting in a perfectly pure water. Additionally, multiple safeguards used in the bottled water industry are taken to ensure the quality of the water, including nine stages of filtration and the use of UV light before being bottled. The Total Dissolved Solids (TDS) contained in Infinity Air Water are below 20 mg/l, which means only the required minerals are present. With a pH of 8, this alkaline water is a powerful anti-oxidant, helping to boost the immune system and balance the pH in your body. Infinity supports the reduction of plastic and single-use glass bottles. They only use glass and by returning glass bottles, Infinity’s clients not only pay just for refills but also are contributing to the reduction of at least 2 million plastic bottles per year. Additionally, distribution crates are made of wood, a reusable, repairable and renewable material. Infinity Air Water and Aquacello, Importer, Distributor and full service centre for Atmospheric Water Generators, have recently entered into a Strategic Alliance Agreement to extend their capabilities to deliver value to clients and collectively focus their marketing, sales, research and development efforts. Infinity Air Water is a South African bottled water company located in Stellenbosch that harvests the humidity from the air to bottle pure and soft water for distribution in Western Cape. Infinity has a harvesting capacity of one million litres of drinking water per year to be distributed mainly in glass bottles but also in bulk according to client needs. The company’s Sustainability Model is based on three elements that result in a superior quality product and service: water harvested from the air, Refill System and Sustainable Packaging.